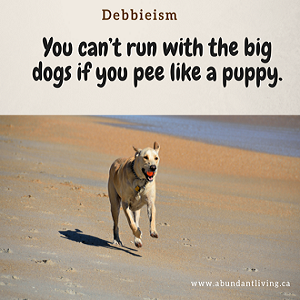 Have You Heard of a "Debbie-ism?" - Abundant Living, Inc.
As someone who was born, raised and has lived almost my entire life in Atlantic Canada, it should come as no surprise that I have naturally incorporated local colloquialisms into my teachings and practice. Sometimes I repeat sayings I heard growing up and other times they’re my own unique twist on a phrase that just rings truer for me when I say it a certain way – so I assume it would make more sense for my audience as well. Having interacted with thousands of people over 34 years of teaching and almost as many coaching and consulting, many of them have come to be known as Debbie-isms, most recently amongst my program participants, some of whom have spent anywhere from 40 to 240+ hours in a classroom with me. Among the favorites are “you can’t run with the big dogs if you pee like a puppy.” My former business partner Craig used to say this all the time (I think he first heard it from a client) and it quickly became an integral part of our language around the office. It speaks to the importance of not playing small or shrinking around others you perceive may be better than you just because they strut a certain way. Whenever we took on a new project, we were determined to give it our all and to show our clients they made the right decision by putting their trust in us. Rather than buying into the “fake it until you make it” school of thought, we believed in only taking on what we knew how to do, getting our ducks in a row before we started, surrounding ourselves with talented people, making sure we had the resources needed, allowing for ample time to complete the work, and then knocking it out of the ballpark. That’s what it looks like when you run with the big dogs! Here’s to living life abundantly! I often find inspiration from poems and this one is a long-time favorite that speaks of not playing small. 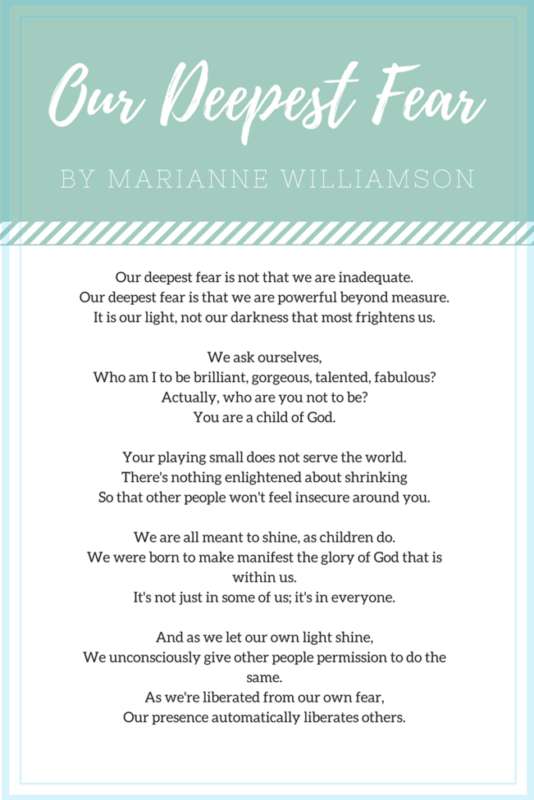 It is from one of my teachers, the inspirational author, and lecturer Marianne Williamson. As the owner of Abundant Living, Inc., I am a Business and Life Coach with over 20 years of experience. As a coach, my strengths are in my ability to truly listen, to trust my intuition for what is spoken as well as unspoken, and my strategic approach to managing change.